Our first information, long ago, incluided a setlist supposedly from this show. That's why the URL of the page (for those who notice such things) is possibly misleading. With so many pages linking to it, however, we're not about to change the URL. 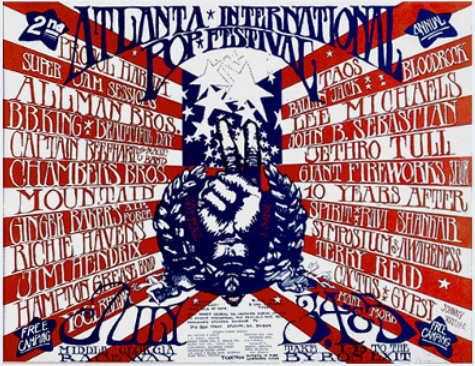 A correspondent, Bill Mankin, writes, 'I worked for both Atlanta Pop festivals and am a bit of an amateur rock festival historian ... Procol Harum did not play at the 1969 Atlanta Pop Festival. However, they DID play at the 1970 Atlanta Pop Festival – a different event, year, location and poster.' Thanks, Bill, for pointing us to the correct poster.